Influences from Arabia, Africa, Spain (and, of course, Italy) make Sicilian cuisine a veritable melting pot of flavour. 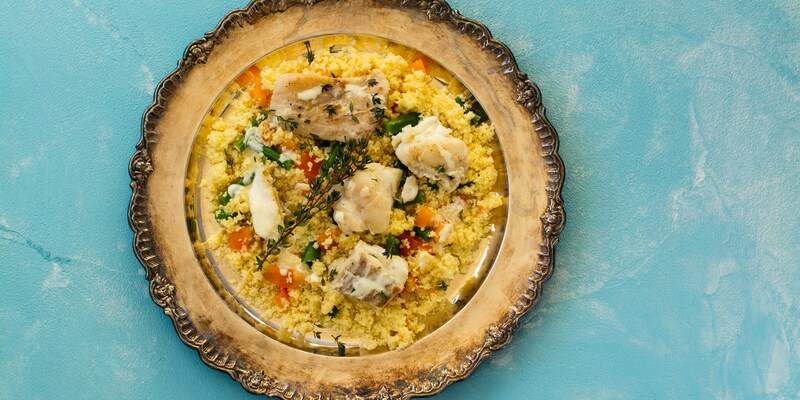 Here are ten of the island’s most famous dishes that simply must be tasted if you’re visiting the crossroads of the Mediterranean. There’s a lot to like about Sicily. Pristine beaches with turquoise waters perfect for swimming in; ancient architecture steeped in some of the Mediterranean’s richest history; towering volcanoes rising out of beautiful countryside and a relaxed way of life that makes you want to turn any visit to the island into a permanent holiday. 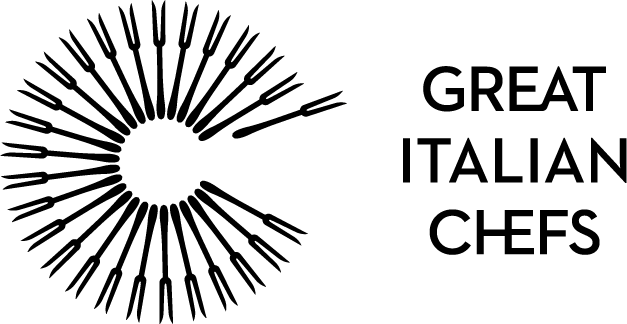 But of course, as with most of Italy, the main attraction is the local food scene. 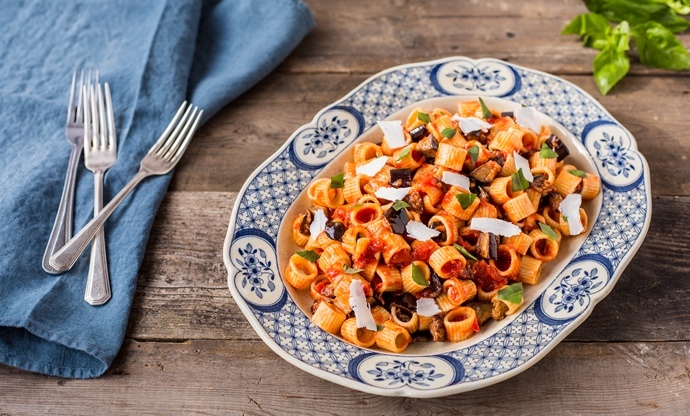 Sicilian cuisine is incredibly unique – while much of it is clearly Italian (there’s plenty of pastas, olive oils, wines and seafood) there are some commonly used ingredients that clearly stand out. Raisins and saffron crop up in the island’s most famous dishes, and cooking techniques differ from those found on the mainland. Sicily has been conquered by a whole host of different nations over the years, including the Phoenicians of North Africa, the Islamic Moors, Greeks, Romans, Normans and Spanish, among others. By the time the island joined the Kingdom of Italy in 1861, the local culture (and food) was so heavily influenced by its past that it was always going to stand out. Today, Sicily is one of Italy’s most popular tourist destinations, and it’s the food that keeps people coming back year after year. Soaking up the scenery and eating some of the best food in Europe – what's not to like? If you’re wondering which dishes you should try to get a true taste of the local cuisine while you’re there, make a note of the ones listed below and get ready to enjoy a sun-drenched, flavour-filled, history-steeped holiday. What's not to love about a ball of creamy risotto rice that's breaded and deep-fried? This iconic Sicilian dish is the one thing you simply must try when on the island, and depending on where you are the stuffing, shape and even spelling of arancini will differ. Often piled high in shop windows, they're the perfect snack whilst you stroll along the streets of the island's many towns and cities. Arguably Sicily’s most famous culinary export, caponata is now seen on menus across Europe. But it’s the perfect example of external influences over the island’s cuisine. 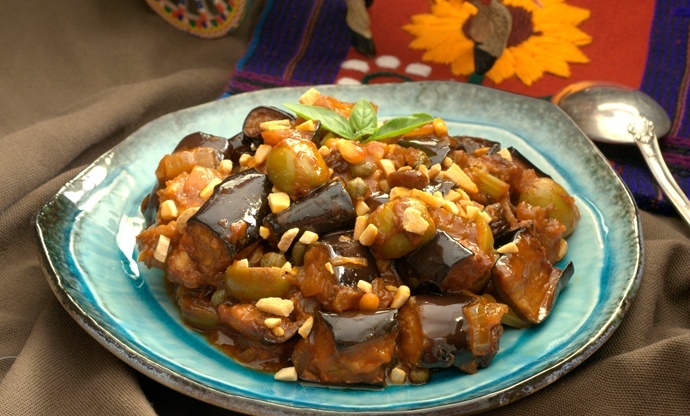 The recipe can change from household to household, but it must always contain aubergines, pine nuts, raisins and plenty of vinegar. Served at room temperature, usually as an antipasto, the fried aubergine is turned into a stew with celery, onion and tomatoes, before being flavoured with capers, olives, pine nuts and raisins. The sweetened vinegar finishes it off with a lovely tang. 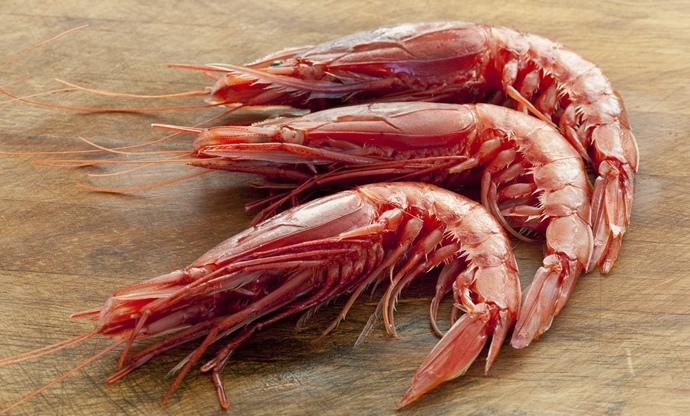 Being an island means fish and seafood is obviously integral to the Sicilian diet, and Italy’s famous gambero rosso (red prawns) are caught by the local fishermen. 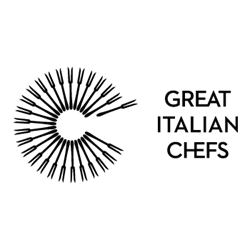 Those from Mazara del Vallo on the western coast of the island are regarded as the best in the world, being sent to the very best Michelin-starred restaurants throughout Italy. When they’re at their freshest, however, there’s no need to do anything to them at all – locals know they taste best when simply dressed in a little local lemon juice and olive oil and eaten raw, a real treat for any foodie visiting Sicily. Pasta al pesto Genovese is a dish from Liguria (in northern Italy) that puts one the most famous pasta sauces – pesto – centre stage, but there’s actually a Sicilian variation too (probably thanks to historic trade routes between Sicily and the Ligurian city of Genoa). 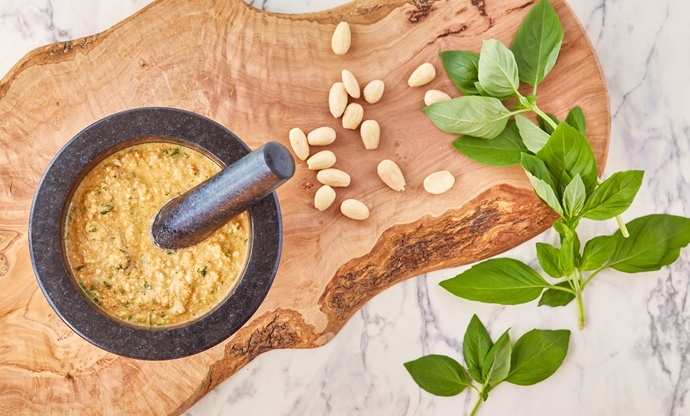 It’s most commonly seen in Trapani, where cooks will bash together almonds, tomatoes, basil, garlic and Pecorino cheese in a pestle and mortar to create a pesto-like sauce. It is traditionally served with busiate, a local pasta shape which is similar to fusilli and looks a little like a telephone cord. Head to Catania on the east coast of Sicily and you’ll find one of the island’s most famous pasta dishes served with gusto. Pasta alla Norma is arguably the best representation of Sicilian cuisine out there, making the most of local tomatoes, aubergines, garlic, basil and ricotta salata, salted ricotta. It’s called Norma after the nineteenth century opera of the same name – both the dish and the music are regarded as true masterpieces. If pasta alla Norma is the perfect vegetarian Siclian dish, then pasta con le sarde is the fishy equivalent. 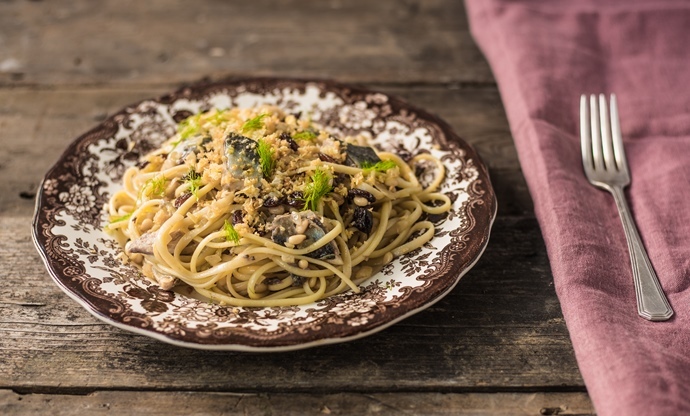 Fresh sardines, salted anchovy fillets and wild fennel are made into a sauce with distinct North African flair thanks to the addition of pine nuts, raisins and saffron, before being stirred through bucatini, a type of spaghetti with a hole running through the centre. Many restaurants in Palermo will sprinkle crisp breadcrumbs on top for extra texture, and you’ll sometimes see white wine or almonds added as well. 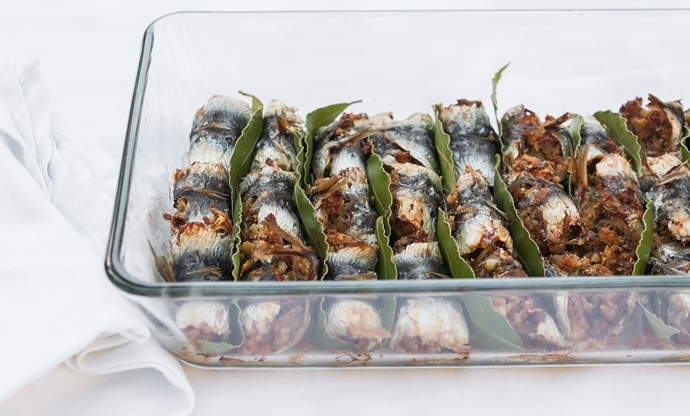 Sicily is famous for its sardines, with big, fat specimens caught off its shores every day. They're prepared in all sorts of ways, but one of the most popular is a beccafico, which sees them stuffed with pine nuts, raisins and breadcrumbs before being baked. 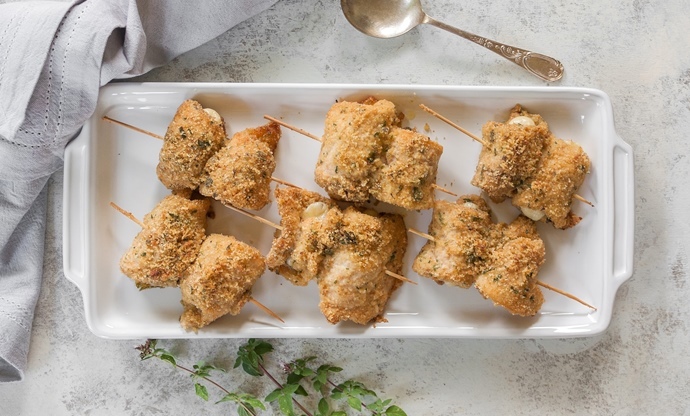 Sicilians pride themselves on their simple approach to cooking, but these swordfish rolls are a little more involved than the island’s more famous fare. Thin slices of swordfish are topped with capers, pine nuts, raisins, olives and lemon, before being rolled up into a spiral and secured with a skewer. They’re then baked, fried or grilled, sometimes with extra breadcrumbs around the outside, too. The perfect little taste of Sicilian cuisine. Of course, Sicily has its fair share of famous sweet dishes and desserts, too. 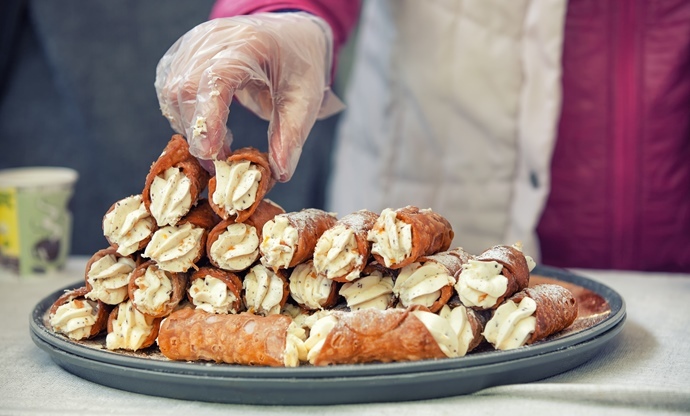 One of the island’s greatest exports has to be cannoli, little deep-fried pastry tubes piped full of creamy ricotta that are now sold in bakeries all over Italy. There’s also cassata, a Sicilian sponge cake flavoured with chocolate, citrus fruits, marzipan and a sweetened ricotta cream. Semifreddo alle mandorle is an almond parfait served in place of gelato in many a Sicilian restaurant, and if it’s your birthday you may be lucky enough to receive a torta Setteveli, a seven-layer chocolate and hazelnut cake. In Sicily, breakfast is almost always a fresh, warm brioche bun with a bowl of frozen granita, flavoured with fruit or coffee. It's especially welcome in the baking heat of summer, and you'll often see cafés full of people enjoying this wonderful combination before getting ready for the day ahead.